You know those "Got Milk" commercials where someone is eating peanut butter and reflexively grabs for a glass of milk only to find that they're out of milk? 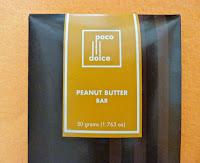 I felt a little like that today after eating this Peanut Butter Bar from Poco Dolce (San Francisco, CA). "Hey, where's my water?" I pondered. This bar was rich, dense and creamy, just like the natural peanut butter it contained. Said peanut butter was thoroughly blended into a base of bittersweet chocolate, and seasoned with the occasional tiny burst of grey salt -- that helped balance the sugar in the chocolate. 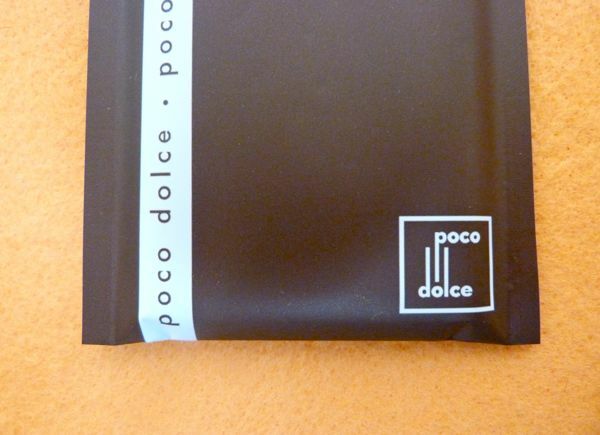 Poco Dolce, Italian for "little sweet," focuses on artfully blending sweet and savory flavors in their chocolate bars and bittersweet tiles, and they were successful here. 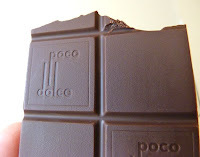 I bought this bar last month during a walk across Golden Gate Bridge. The inner sealed pouch kept this bar in great shape. Today was Day #5 of Chocolate and Peanut Butter Theme Week.